NGINX is an open-source, high-performance HTTP server and reverse proxy, as well as an IMAP/POP3 proxy server. NGINX is known for its high performance, stability, rich feature set, simple configuration, and low resource consumption. This past week, out network staff have upgraded the hosting platform for the 10MB free hosting service Register4Less.com provides with every domain name. The server for the http://Register4Less.com website itself has also been upgraded to NGINX. The hosting platform had been using Lighttpd for a number of years before the upgrade. using latest stable Nginx web server for better security. While our staff are confident that the change from Lighttpd to NGINX will be seamless, we ask that if you are using our basic hosting platform and see any issues to contact our support team. 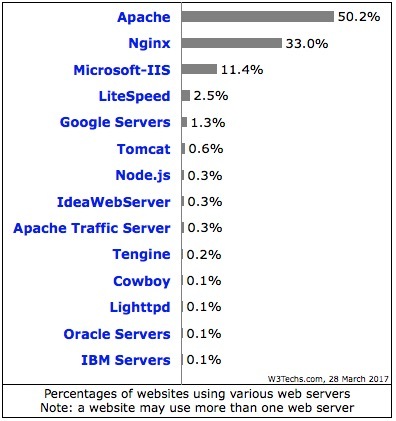 In the industry today, NGINX is second only to Apache in terms of volume of sites that use it as the web server application. If you have email aliases setup with R4L (why not, they’re free) and forward your aliases to a gmail account, you can use our new SMTP service in order to configure GMail to use this alias.